Hey there folks! Yep, you guessed it – One Room Challenge update time! This update is going to be short because, well, it’s week 4 and I still have a lot to do!! AACCKK!! This week has been all about building. I’m super happy to report we are done with that. If you are following along on Instagram you might have seen yesterday where I was taking a break from all the measuring and cutting and leveling and hammering. And, I decided I didn’t really like building. Give me something I can tear up and remake and I’m good. But, building from scratch (not to mention 8ft structures you don’t want to fall down on you), is a LOT of work and a LOT of stress. Hubby has been a rockstar. He has pushed me when I wanted to quit, he has cut many a piece of wood, he has suffered a couple of injuries for the cause, and he has been the best cheerleader! You wonderful people have been cheering me on too – reminding me to keep my eyes on the prize, that it will be worth it in the end! And boy am I excited, because now that I see my vision come to life – I know that this is going to be a game changer. Organization at it’s finest. Aaahh. Only two more weeks to go!! We can do this! This week will be all about the paint, and then it will be finishing up all the little details that will make this space unique to us. Budget wise I feel like we are doing good. I don’t have any hard numbers (need to round up all the receipts), but I feel like I’ve gotten some good deals and we managed to not go over on the wood. Be sure to check out the other linking participants in the One Room Challenge, and the designer group as well. Lots and lots of inspiration out there!! Thanks Tammy! Yours looks great! I’m so looking forward to everything being much more organized for sure!! Yes you can! I just finished mine in February and am still so inlove with my master closet! Can’t wait to see it all done! Thanks Vel! Yours looks awesome! So organized! That’s what I’m looking forward to the most! Yay! The hard part is over, now on to the fun stuff! Yay! Time to get organized! Denise! Wow!!!! 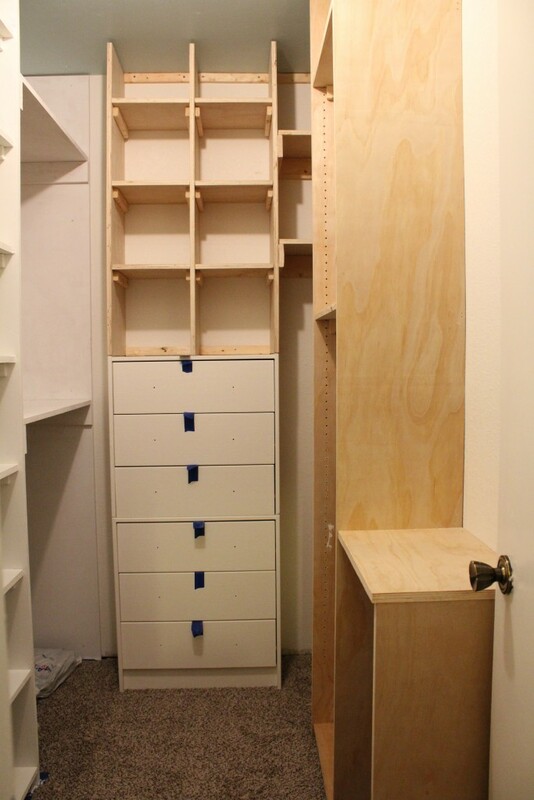 Your closet is going to be amazing and so organized!!! I can’t wait to see more!! Huge fist pump for week 4 – you’ve done so much already! Thanks Lisa!! So glad the hard part is over!